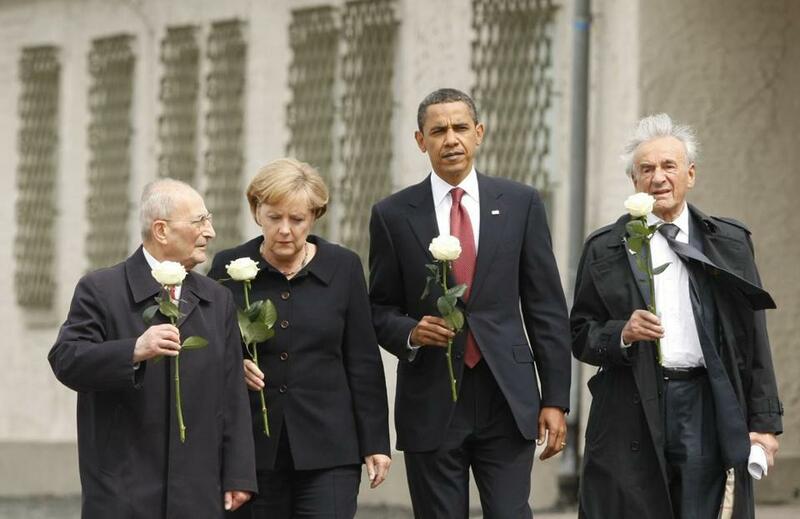 President Obama toured the Buchenwald concentration camp in 2009 with Elie Wiesel (right). “If I survived, it must be for some reason.” Elie Wiesel spoke those words in a New York Times interview in 1981. Throughout his life, Wiesel lived with purpose and lent meaning to his survival. As a witness to the most extreme atrocities and in his lifetime as an activist, he changed the way we think about human rights and the way we understand our responsibility to each other. It is hard to imagine now, with “Night” selling over 10 million copies and being a fixture on the curriculum of many American students, that at the time of its initial publication, the world didn’t know what to make of it. It is well-documented that 15 US publishers passed on the book before Hill & Wang picked it up. Wiesel wrote in the face of apathy, shame, and denial. The book, along with the trial of Adolf Eichmann in 1961, changed the way the world saw the Holocaust. While others stood silent, Wiesel grappled with the moral and theological implications of mass genocide. Wiesel frequently pointed out that the “opposite of love is not hate, it is indifference.” This is a critical point. I don’t seek to make comparisons or draw false equivalencies to the Holocaust, but when we see xenophobia and bigotry, mass incarceration, refugees turned away from our borders, we need to confront our own indifference. In a year when a presidential candidate has adopted the same “America First” slogan used by Franklin Roosevelt’s political opponents to urge neutrality in World War II, and when Leave campaigners in Britain printed posters depicting refugees in a direct visual echo of anti-Semitic Nazi propaganda, the challenges we face are clear. We can see our political memory changing in alarming ways. At the news of his death, Israel’s President Reuven Rivlin called Wiesel “a hero of the Jewish people.” That is true. But Wiesel’s message was universal. He stood up against atrocities in Cambodia, Rwanda, Syria, Darfur, Nicaragua, Argentina, South Africa, Russia, and Bosnia. He challenged US presidents when they failed to live up to the responsibility of the office, as he saw it. If Wiesel taught us that indifference is the opposite of love, Dr. Martin Luther King, Jr. wrote the next entry in our social justice lexicon, “love without power is sentimental and anemic.” Together, they urge us to not stand by, and remind us that acknowledgement of injustice alone is not enough. As a teenager, “Night” introduced me to the horror of the Holocaust. But I was also lucky enough to hear Wiesel speak in person at the 92nd Street Y in New York. It would have been understandable for Wiesel to become cynical about humanity. Wiesel was anything but that. I encountered a soul whose work was full of vitality and urgency. His call for love and freedom was wide-ranging. After experiencing the ultimate human capacity for evil, his work was marked by an optimism for the opposite, our potential to create a more just world. Rabbi Jonah Dov Pesner is the director of the Religious Action Center of Reform Judaism. Previously he was a congregational rabbi at Temple Israel in Boston.